As our lifestyles have evolved over the last few decades, there’s no doubt that the kitchen has become the hub of the house. Whether the focus is fine food, family management, entertaining or all three, this multi functional room has expanded, opening up and encompassing other living spaces. 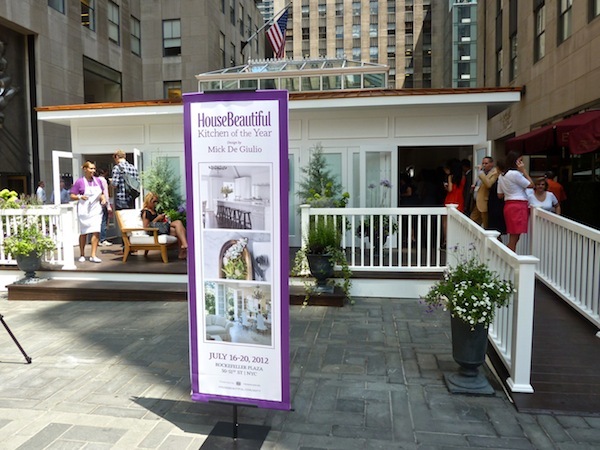 So it was with great anticipation that this week marked the debut of the 5th House Beautiful Kitchen of the Year in Rockefeller Center. 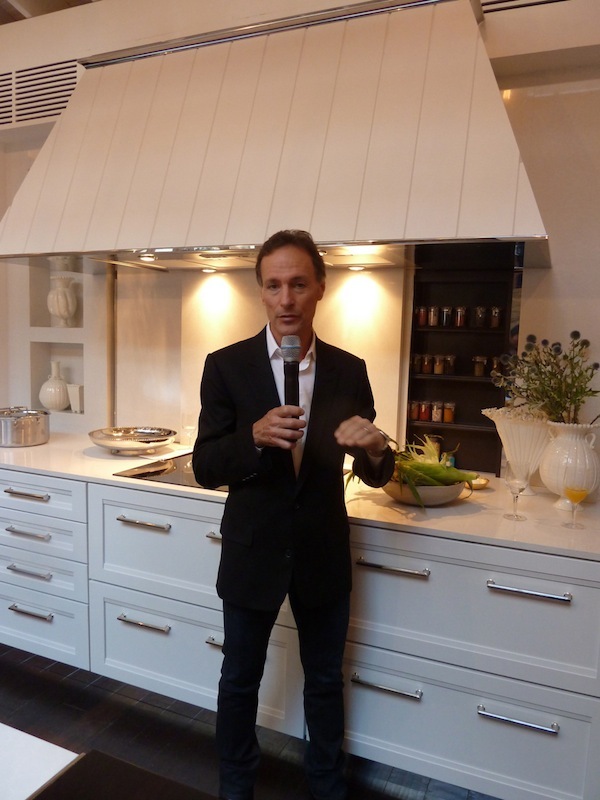 Creator of this year’s edition, renowned kitchen designer Mick De Giulio was on hand to effortlessly guide us through a press preview and tour Monday morning. as well as more interior entertaining space to make it truly feel like home. As we have been discussing, the demarcations between indoors and out have been blurring and this space was no exception. De Giulio cited his inspiration as Scottish fishermen, keeping the design simple and clean including an earthy livability that exudes a sense of comfort and warmth within the otherwise crisp and clean space. House Beautiful editor-in-chief Newell Turner made himself at home in the dining area, where a wonderful mix of textures, capped by Circa Lighting’s aged iron Ralph Lauren Roark chandelier, help bridge the gap through to the terrace beyond the french doors. 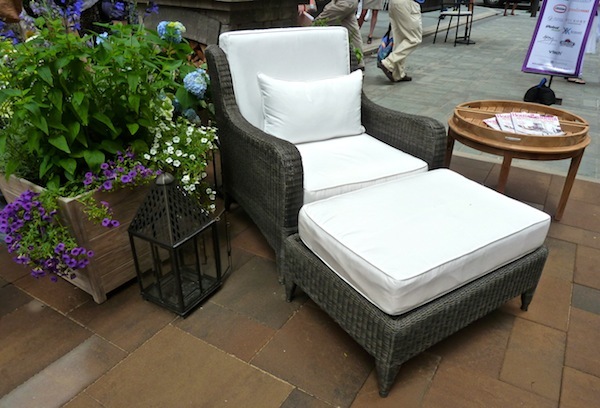 The all-weather Frontgate Monterey chairs, for example, made an appearance both at the rustic chic Kravet custom kitchen table and on the terrace. The tour started with the House Beautiful team, Sean Sullivan, group marketing director and associate publisher of the Hearst Design Group , EIC Newell Turner and SVP, Publishing Director and chief revenue office Kate Kelly Smith walking us through the sophisticated technological innovations in the magazine (the House Beautiful Connect app and print to pin option) and announcement of their first digital property, the upcoming Ultimate Kitchens (sponsored by Kohler), a step by step guide to everything you will want to do in your kitchen. 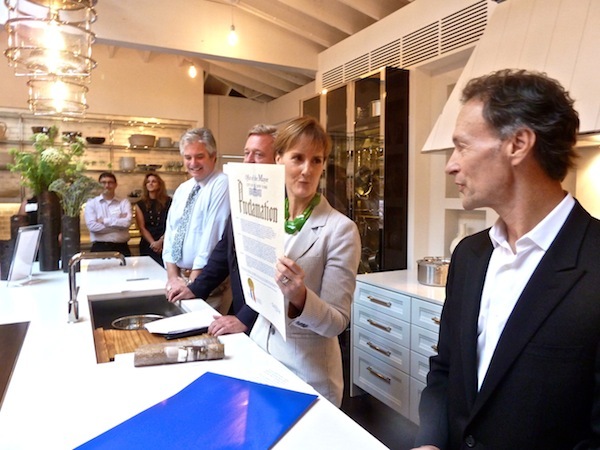 Kelly also shared the official proclamation by Mayor Bloomberg that this is Kitchen of the Year week!! 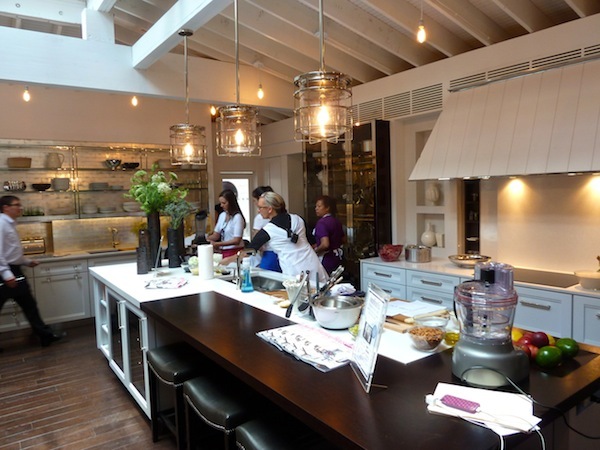 There are also many more culinary events tied into this edition of Kitchen of the Year, proving it to be not just a beautiful kitchen but a fully functioning workhorse as well. Here, Gabrielle Hamilton, chef/owner of the popular East Village restaurant Prune was preparing for the first of several cooking demonstrations. Newell Turner shared that in addition to the October House Beautiful edition featuring the kitchen, the November issue will include many of the inspiring recipes in an American Holiday table segment. Stop back next time when we take a look at all the incredible details that have earned Mick De Giulio his place as king in the kitchen. This entry posted in architecture, design, food and drink, furniture, interior design. 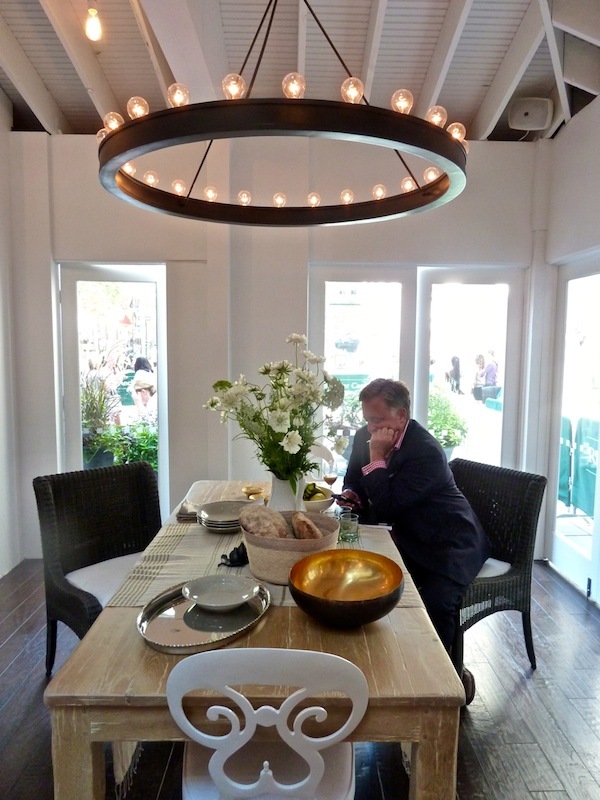 Entry Tags: Circa Lighting, Frontgate all weather wicker, House Beautiful, interior design, Kitchen Design, Kitchen of the Year, Kravet, Mick De Giulio, Prune Restaurant, Ralph Lauren lighting Bookmark the permalink. I wouldn’t change one single thing – oh except the cooktop, I prefer gas. 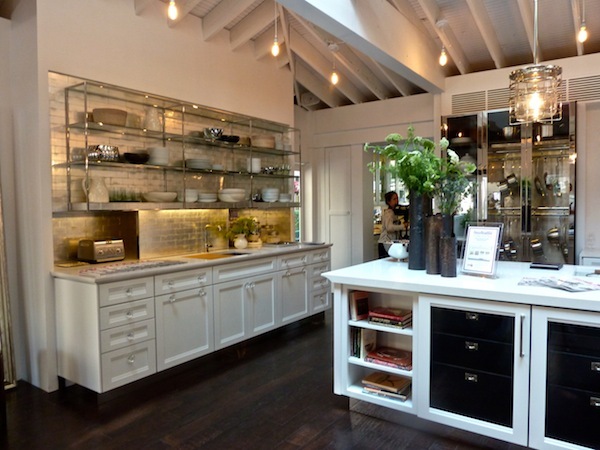 I love that glass fronted cabinet, the lighting, the flooring and everything in between. That RL chandelier kind of looks like a crown, it reminds me, in a way, of the lighting in the ballroom at the Del in Coronado. I saw this on the Today show, but these images are fantastic, and I get a longer view. Stacey, can you imagine having a kitchen like this. Add a bath and a bedroom, and this is all I would need! My faves: exposed whitewashed rafters, open commercial kitchen style shelving, and the Oly chair at the table (great silhouette). What a beautiful kitchen. I love the open shelving above the sink and the positioning of the tv on the fp wall. Beautiful, relaxed, polished space. It looks easy to cook in! I just saw this kitchen yesterday in my magazine and fell instantly in love with it. It contains everything a person could hope for while being very stylish and timeless. Looks like the perfect room for cooking up a storm and gathering with friends and family. It’s that outdoors space that I’m drooling over, though… perfect for homemade pizza night! How lucky are you and what a beautiful space. We would have to step up our game in such a kitchen and would definitely be using that pizza oven. Newell looked really at home checking his email! Fantastic post! Gorgeous design.. The kitchen is stunning and I like the outdoor area. This looks like an amazing kitchen – De Giulio is one of my favorite kitchen designers, ever since I saw a picture in House Beautiful several years ago of ‘the perfect kitchen’. I really like the Kravet kitchen table – it’s hard to find a good simple four leg kitchen table these days. That kitchen is absolutely beautiful and the outdoor kitchen too!! 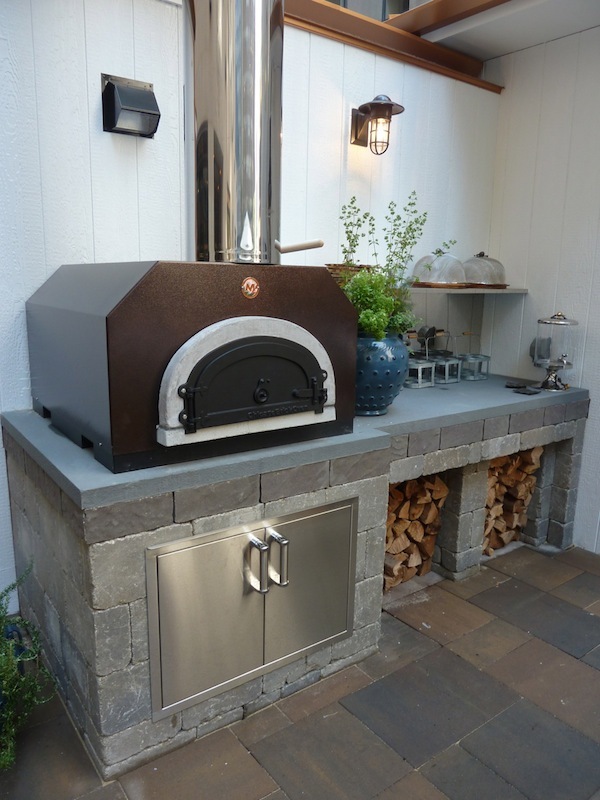 Who wouldn’t want a pizza oven in their backyard? How lucky are you, girl?! Thanks for sharing these photos with us! These are beautiful. 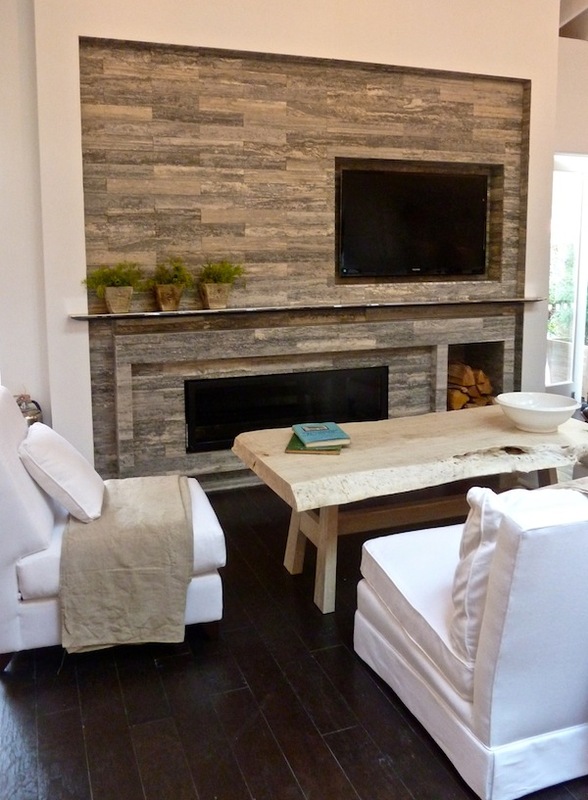 Love that fireplace mantle with the tv built right into it! Thanks for the sharing this with us. How gorgeous! I am excited to see more details on your next posting. And I love the sound of all those cooking demonstrations, especially by Gabrielle Hoffman. Oh I wish I was in New York! Obsessed with that Circa light fixture, and that amazing stove hood! 78 queries in 0.428 seconds.